Make diversity your competitive advantage To reap the full benefits of diversity and inclusion, today's forward thinking companies look past "diversity" training towards a more comprehensive, holistic business approach. These leaders incorporate diversity and inclusion into every aspect of business culture, employee engagement, talent management and market penetration. 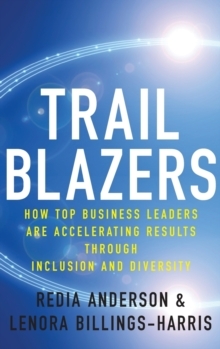 Trailblazers reveals the practices, metrics and research, as well as the anecdotal evidence, for building and sustaining workplace cultures that make strategic diversity and inclusion a business necessity. Focusing on concrete actions you can implement immediately, this insider guide profiles the best practices award-winning companies have used on a sustained basis to transform their organizations. * Captures insights and best practices from the most effective Chief Diversity Officers, several of which are determined by the Diversity Inc Top 50 Companies for Diversity * Companies profiled include IBM, Dell, Verizon, Merck and Co, Sodexo, Verizon, Andrews Kurth, The Coca-Cola Company, American Airlines, Citi, Ford, Shell and Pitney Bowes * Covers everything from how to use employee resource groups to help target consumers and forge tighter client relationships; from talent optimization, leadership development and retention, to increasing middle management engagement and the skill-sets required for effective Chief Diversity Officers as true business partners and more Trailblazers gives you an in-depth view from the inside out of which practical solutions make diversity and inclusion efforts a systemic and winning way of doing business for today's top-performing companies.